In the year 2000 I was faced with two hard, but necessary lessons. The realization that I had in that moment is what started my journey to becoming happy & healthy. It began with two important lessons. Lesson #1: I was unhappy and unhealthy because of the lifestyle choices I was making. Lesson #2: I could become happy and healthy by changing my lifestyle choices, changing my attitude, and choosing to be happy and healthy. Taking the “wrong” path often leads to the right path, as long as you look for and can see the lessons. We all make what we think are bad choices, but the great thing about life is that we get lots of do-overs to make other choices. Some will be bad and some will be good. Your choices will be what brings you down the path of happiness or brings you down the path of unhappiness. Your choices will be what makes you feel healthy or makes you feel unhealthy. If you make a bad choice, and you say, “I don’t like myself for doing that,” you can choose to make it better. Only you. 17+ years ago, I wanted to blame everyone but myself for why I was so unhappy. The truth is, it was my decision to live life unhappily. You can’t blame anyone else for the choices that you make, they are yours and yours alone. Even choices that you made with someone else. You have to own up to the fact that you decided to make that choice, instead of another choice. No one forced you to decide to have a poor diet that caused you to gain weight. No one forced you to marry someone you didn’t love. No one forced you to take that job that you hate. No one forced you to have kids. No one forced you to watch t.v. instead of exercise. No one forced you to have a negative attitude. No one forced you to drink until you became sick. No one forced you to be friends with toxic people. No one forced you to spend beyond your means. We make all of these choices. I know, it was a shock to me too. That was a hard lesson for me. “I made these choices and can’t blame anyone else?” Nope. Here is another kicker. Even when someone else does something that you don’t like, you have the choice on how you react. Your attitude is your choice. You have the choice to stay and live in pain, or to find a way to move forward. 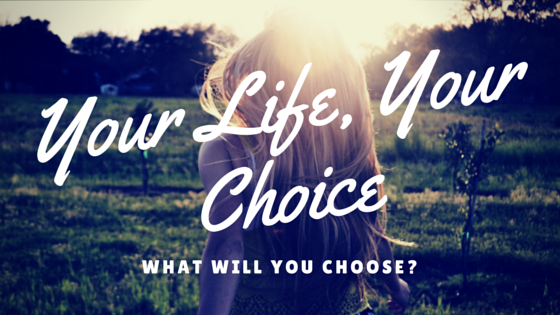 It might be incredibly difficult, but you have the choice. Doesn’t make you feel incredibly powerful? In conclusion, I have made and will continue to make a lot of “bad” choices in my life. I don’t look at mistakes as bad choices, I look at them as a learning opportunity. What did I learn? How can I do better? How can I be better? Don’t get me wrong, I have moments where I think it is all over and there is no way out of this one, but I’m able to bounce back quickly because I understand that I have the power to make another choice and take back my power. I have the power to rewrite my story. And I always remind myself, that it will be what I do with that setback that will define me. Sending you love, positivity & the courage to make choices that will forever raise you up.